The Ortofon OM Q.Bert Turntable Cartridge is excellent at finding grovein your vinyl and staying there. Designed together with DJ QBert for scratch and back-cueing, the OM Q.Bert tonearm cartridge uses a spherical diamond enabling very high output (10 – 11 mV). 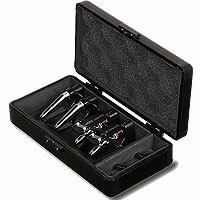 Ortofon technology makes high sound quality and low record wear possible at the high tracking forces needed in discos. DJs all over the world make very high demands of their professional equipment. 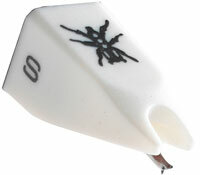 The cartridge plays a decisive part in helping them realize the scratching, back-cueing, and live artistic performances that are such a big part of the show. Reliability and robustness is vital, when night after night the turntable cartridge must withstand these demands as well as extreme sound pressure and vibration. Scratching and back-cueing impose heavy mechanical stress on the cantilever and its rubber bearing. Therefore, Ortofon disco cartridges like the DJ Q.Bert are equipped with cantilevers made from aluminum tube with increased wall thickness. Special attention has also been paid to the attachment of the bearing and the design of the bearing itself. This means that rough treatment will neither damage the cartridge nor degrade its stability. 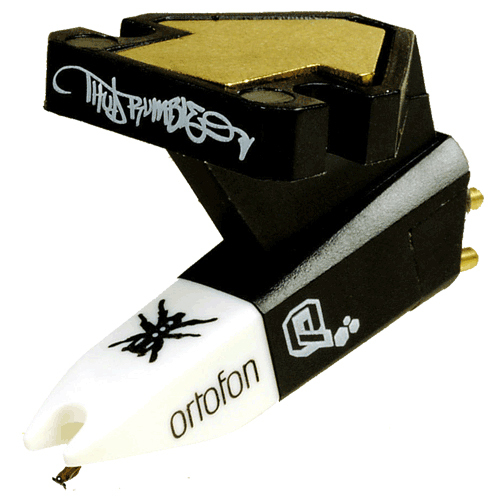 For easy cueing, the Ortofon OM DJ Q.Bert cartridge's nose has an extra-large cutout which makes the stylus freely visible from above. Further, the tip of the cantilever is fluorescent for more accurate placement. Output voltage at 1000 Hz.